We've just finished another order for baby shower :). It's for a baby boy who will be born in the year of the rabbit...hence the little blank cards and a special blank card of Benjamin's face :). I do hope the recipients are happy with what they got and would find them useful :). I love the fabric's color :). Dearest lia, this baby shower goodies are gorgeous! 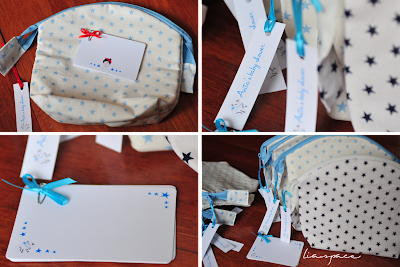 I love the cards and that adorable pouch! Happy new year! Wishing you LOVE and JOY this new year. Have a lovely merry happy day and love to you! ps: im praying for you that the flood doesnt get to your home! Take good carez!